Two days before I left for NYC I became ill. While I was improving, it was still a struggle every morning to get up and and get out the door. Normally I'm a night owl, but to keep my energy up in NYC I made an effort to get into bed really early every night, even if I just read for awhile. Day two I woke up and found myself even less motivated. Just as predicted, the weather had turned foul over night. Heavy rains and driving winds made a lot of the things on my to-do list not that appealing. Anything indoor was the best choice.. I had visited The Met, The Guggenheim and MOMA last time, but here were several other museums of interest that could fill a rainy day. 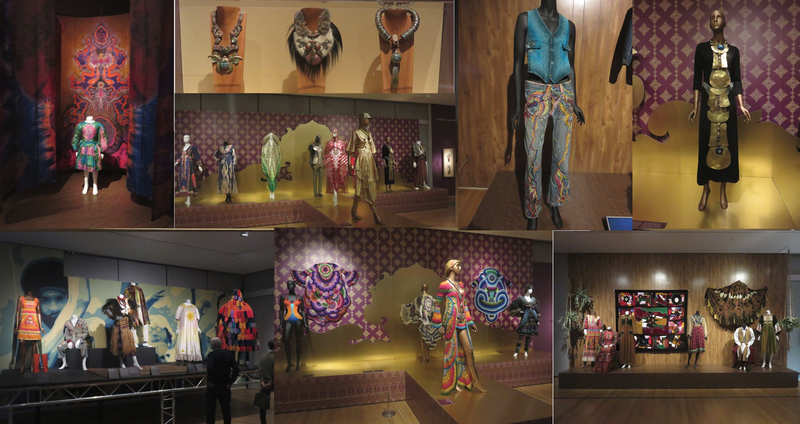 One of particular interest was The Museum of Arts and Design (MAD). I decided to make this a shorter day of exploring as a friend back in Vancouver let me know about a book signing in the evening that looked interesting. This museum was perfect as it was close by, only 2 short subway stops from my Airbnb. It also featured a new show I thought might be interesting called Counter-Couture:Handmade Fashion in an American Counterculture. 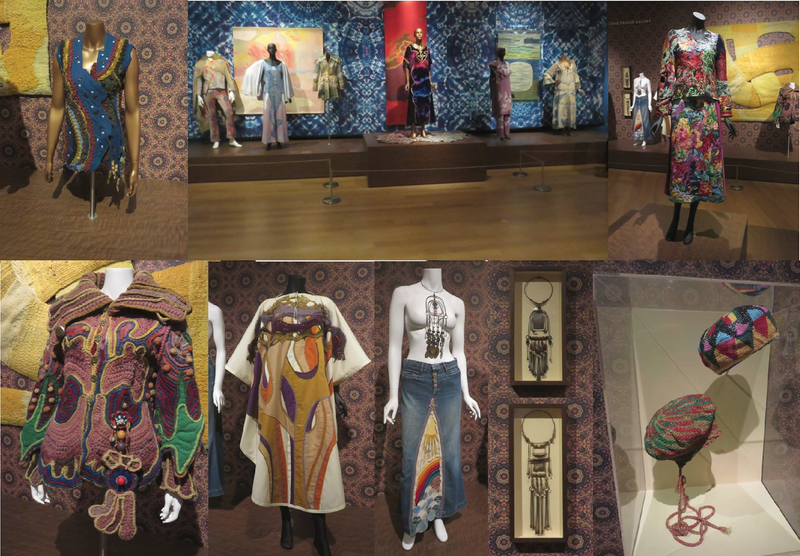 The focus of this exhibit was not about the full range of what people wore at the time, it was specifically about the handmade fashions that became a cultural signature in the 1960's and 1970's. "The pursuit of a personal style proved a transcendental tool toward self-realization, enlightenment, and freedom from conventions. Counter-Couture exhibits garments, jewelry, and accessories by American makers who crafted the very reality that they craved, on the margins of society and yet at the center of an epochal shift. The works on display encompass the ethos of members of a generation who fought for change by sewing, embroidering, quilting, patch-working, and tie-dyeing their identity. Putting the handmade at the center of their daily revolution, they embraced and contributed to establishing a craft and folk sensibility in a seminal moment for the development of American Craft." Counter Culture was a large exhibit covering two full floors of the museum and a fascinating walk back in time. Displays featured garments created using quilting, tie dye, denim embellishment, crochet, knitting, hand painting and more. Large jewelry showcased hand crafted metal work. Music, vintage images and power points on a few designers completed the show. I thought I would find the show amusing and perhaps a bit tacky. I was wrong. 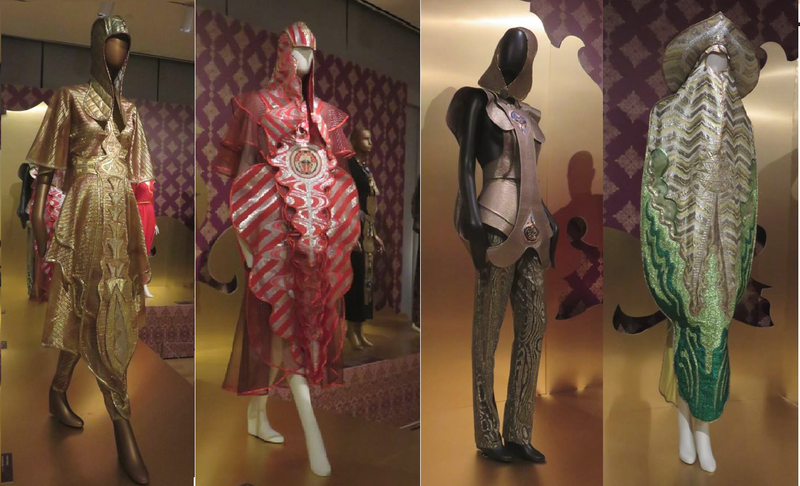 The exhibition featured garments from the best designers of the era. There were a few that obviously look dated such as a quilted suit, but several timeless pieces as well that could be worn today. I was lucky when a young guard joined me at a display to give me some detailed background on one garment. It had been hand painted with a dye that is no longer available and cured in the sun. Most interesting was the inclusion of work by San Francisco designer Kaisik Wong. His garments were offered hints of futuristic samurai that stood apart from the more "hippie" look of the rest of the collection. After I finished exploring this exhibit fully, I discovered there was another great one on a lower floor - Judith Leiber: Crafting a New York Story. Although I have done hundreds of interviews with those working in the fashion world, my interest has always been the designer's personal journey. I have little knowledge of fashion history. This exhibit offered me a chance to learn more about Leiber - a well-known craftsman, luxury handbag designer and business woman. It offered a large selection of unique pieces created during her long career that stretched from 1963 to 2004. Most of the handbags on display were clutch size. 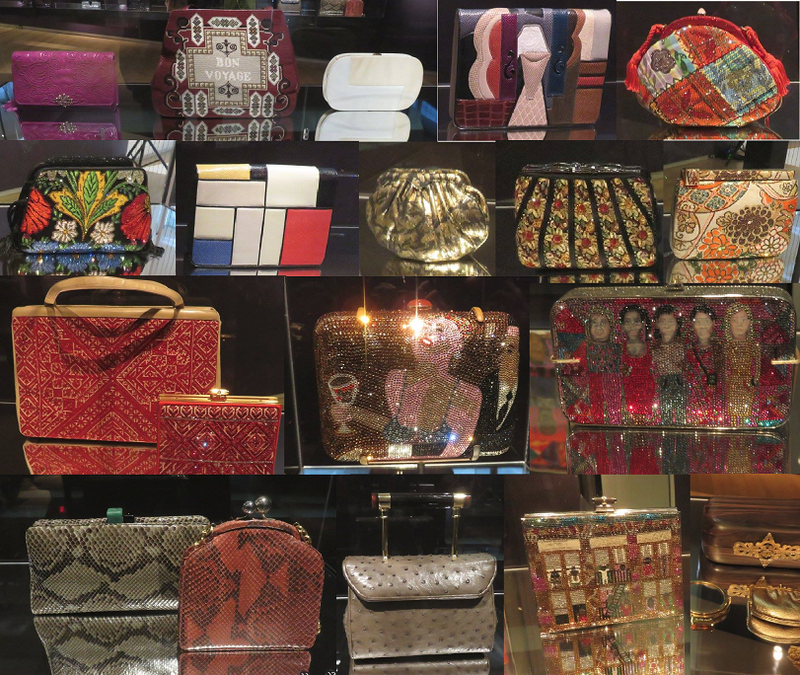 They ranged from finely crafted leather, to textile covered, to Swarovski crystal-encrusted. Art Deco hardware, Lucite and even seashells were incorporated. What I also loved in this exhibit was the long time line along one wall that covered the fashion scene on a larger scale overlaid with Leiber's moments. It was too long to photograph and too many people stood up close reading it for me to walk along and film it. My final stop here was MAD's gift store, I had noticed a very cool folding wooden bowl created from recycled chopsticks and stained to a colour perfect for my living room. Luckily it was also in my price range. Sold! Next I worked my way along the sidewalks - dodging umbrellas and trying to keep mine from being turned inside out by the storm - to get to MOMA. While I didn't want to see the museum displays this time around, I was on a hunt for unique gifts and they have two stores full of great ideas. The first is a gift/book store attached to the museum. Nothing specifically popped for me this time, but I did snag a MOMA coffee cup and Magic Wallet. Across the street is their design store. Things here are more modern with a design/technical orientation. There was one science kit that intrigued me. If I still had kids at home or grand kids to buy for, this would have left the store with me. What did catch my eye were Bao Bao handbags by Issey Miyake. Oh my - there were several I would have loved to take home. Unfortunately they were way out of my budget running from $350 US to over $1100 US! Convert that to Canadian dollars and you'll understand my reluctance. I didn't head out until almost noon and was going to have a short day today, so it was time to head home. I had noticed Cafe 53 on the way to MOMA, so stopped in on my way back to the subway station. This was the perfect place to snag food if you wanted to take it home in particular. They had two coolers filled with beer, wine. an assortment of non-alcoholic drinks, yogurt, etc.. There was a large, two-sided salad bar. Next to it was a large two-sided bar of hot entrees. There was a sushi bar where you could buy pre-made or have it made fresh fresh, and a juice bar where someone was making smoothies and deli sandwiches. Cafe 53 did offer a reasonably large seating area, but it was crowded and pretty utilitarian. I filled up one container of hot food for today, a second full of salads for tomorrow night, snagged a bottle of white wine and was out the door. It was great to be back in my Airbnb early and relax while enjoying my evening meal with a glass of wine. I did a little SEO work, uploaded my pics to my laptop and Facebook, sent my husband an email about my day and then I curled up to relax for a bit. There may have been strong wind and heavy rain. I may not have felt 100%. But there is something about NYC that just creates a spark to sustain you. A short bit of down time and a little food were all it took before I was ready to head out to the book signing. While it was still gray, the rain had stopped. Then came a miracle. I stepped out of the subway into beautiful sunshine. The clouds had parted and it was lovely. My spirits rose accordingly. The book signing was in an incredible vintage store called Sarajo that sold antique textiles and artifacts, costumes, art, jewelry, furniture and much more. Author Tziporah Salamon, a style legend known for her “The Art of Dressing” seminars, was dressed in a style that fit right into the store's ambiance and I was immediately charmed. Her new book The Art of Dressing: Ageless, Timeless, Original Style profiles ten stylish women over age 50, including the dancer Carmen de Lavallade, Marjorie Stern, and artist Michele Oka Doner. “Style does not just happen; it needs to be cultivated, chiseled, refined All are over the age of 50 because it usually takes that long to master this thing called style." I quickly purchased a copy of hers new book which she signed and offered her a signed copy of my book as a gift. Then we posed together (opening picture), each of us holding the other's book. She was total class and went along for the ride. I am so grateful as it meant the world to me to get this pic. Even better, the pic was snapped on my little camera by photographer Mitsuhiro Honda - now a new FB friend. Thanks Colleen Tsoukalas - I wouldn't have been here to get this shot and a personally autographed copy of her new book without you giving me a heads up. What a day. Even better, the weather is supposed to be improving tomorrow so I can head back out onto the streets and explore.